On Saturday morning, P and I sat on our puppy-chewed sofa and read the scant pages of story – compiled in a book from 1974 – we have on our new farmhouse. We know who has owned it over it’s two hundred and ten years – at least for the first 170 of those, and their names ring of people we share earth with now – Tucker, Yowell, Lohr. The mausoleum on the hill – the one I will see every day for the rest of my life, I hope – is the resting place of Dinwiddie Tucker, a man who played professional baseball for two years and who died at age 38. I expect his sister – Effie – is buried there, too, and on the day we move in, I will spend time with them . . . graveyards hold memories and give us places to lay our stories, after all. P and I search “Pennsylvania German houses” and find image after image of homes with two front doors like ours, and we confirm that this house was built with the strong hands that coursed with German – probably Anabaptist blood. And I know I have come home in another way, all the Mennonite ways I have wrapped around myself finding their resting place, too. 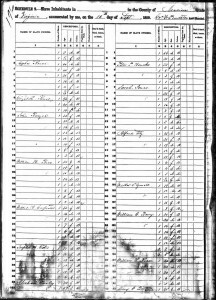 And then I spin into Ancestry.com, and I type in Waller Yowell, the man who owned this place for decades, and I see “1850 slave schedule” and I know that the 1974 book’s sentence — A mount to the west of the house marks where the slave cabins once stood.- is not only correct but also, now, filled with the lives of at least 5 people – 2 women, 3 men, all under the age of 20. I weep now – for the pain of buying a place that once was owned in the same way these 5 humans were, for the weight of coming to carry such a story forward, for the honor of moving into a house where enslaved people worked. I weep, too, for the deep privilege and hope for being able to find their names, to tell their stories, to bring their lives back into words. It is a heavy and a blessed burden. We will likely sign our closing papers later in the day, and so when I imagine my first minutes as the owner of this place, I see myself walking to that western mount in the gloaming. The air around me is light with fall and shines with the slant of ending. I stand on this mount, and I pour out my tears – an ablution, a thanks, a prayer, a promise. In hard ways, this is homecoming, too.